The list is created in order to showcase all the companies that every leader in the wealth and asset management industries needs to know about. As part of the fast growing and demanding Wealthtech sector that has increased five times faster since 2014 it has come to the industry’s attention the huge impact this new digital models are making. The standout companies were chosen by a panel of industry experts and analysts who reviewed an analysis of over 1,000 WealthTech companies undertaken by FinTech Global, a data and research firm. The solution providers making the final list were recognized for their innovative use of technology to solve a significant industry problem, or to generate cost savings or efficiency improvements across the investment value chain. 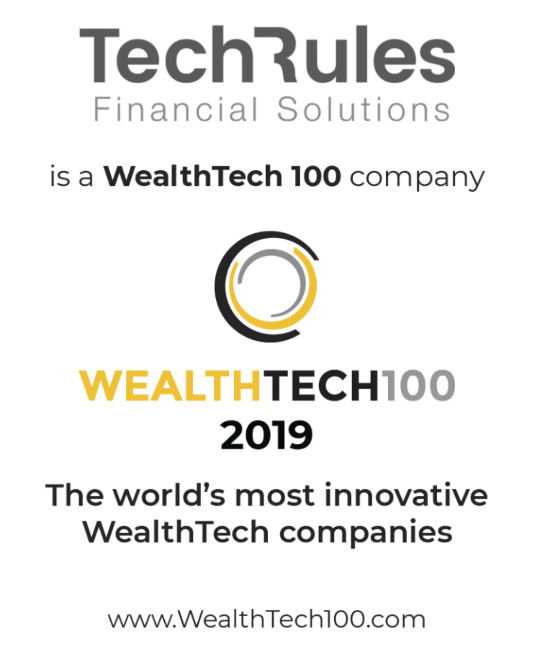 With more than 20 years of experience providing Wealth Management Solutions, TechRules has been able to take part of this list by always showing a disruptive technology and special involvement in R&D with lasting digital impact in the WealthTech industry. The companies has been selected by a panel of industry experts and analysts that can be classified as WealthTech innovation leaders and also that could prove the significance of the problem the solution solves, constant growth, innovation of technology solutions, impact in the value of chain (potential cost saving, efficiency improvement) and how important is for executives in asset management, private banking and financial advisory to be aware of this innovative companies. TechRules ha sido seleccionada como una de las 100 compañías más innovadoras en WealthTech del mundoLights on T-Advisor lite!